Ts. Munkhbayar successfully worked with government and grassroots organizations to shut down destructive mining operations along Mongolia’s scarce waterways. On the sprawling, sparsely populated steppes of Mongolia, outdated and unregulated mining practices have put waterways across the country in jeopardy. With most of its population living in poverty in rural areas and many working as semi-nomadic herdsman, Mongolia faces a serious challenge: to utilize their resources in international trade and to regulate industry in order to protect the natural environment that supports citizens living in very tough conditions. With an unwavering commitment to address this challenge, Munkhbayar is leading the effort to protect Mongolia’s precious water resources from the dangers of unregulated mining. Mongolians living in rural areas rely on the many rivers and tributaries to provide drinking water for themselves and their herds. Today, more than 30 tributaries of the Onggi River (one of the largest rivers in the country) have dried up due to unregulated mining that uses high-pressure water systems to extract minerals. In a country where water is sparse to begin with, the corruption of established water sources has dire consequences. Munkhbayar, born into a family of semi-nomadic herdsmen, heads the Onggi River Movement (ORM), a Mongolian grassroots organization that he co-founded in 2001 to protect and restore the Onggi River. His work has led to the formation of the Mongolian Nature Protection Coalition, which brought together 11 Mongolian river movements and has had significant impact on the awareness of this issue both at the grassroots and legislative levels. As a poor livestock herder, Munkhbayar started attending local council meetings in several villages around his home in the early 90s, representing the voices of herders on issues that affected them: land use, water access and taxation. As a result, in 1996 the local people elected him to chair the local citizens’ council, a rare occurrence for a non-elite Mongolian herdsman. As chairman, he engaged and confronted the provincial and senior government officials on community issues. Munkhbayar became increasingly concerned about the shrinking Onggi River and, with the support of the local people, successfully helped to stop destructive mining operations. Munkhbayar believes in empowering local citizens to protect and restore the river. He has focused on increasing citizen awareness about the need to maintain natural resources. He holds seminars and workshops to educate herdsmen about their rights as citizens and about environmental issues. Prior to Munkhbayar’s work, few local citizens had been educated about environmental protection, and there were few opportunities for people to participate in shaping government policy. 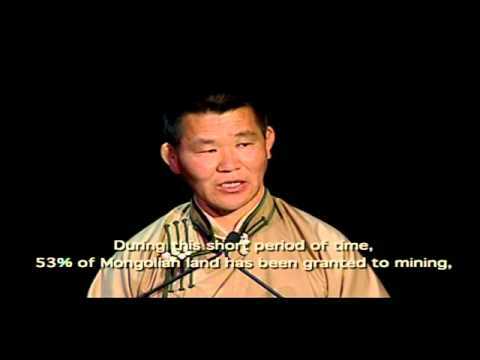 In just a few years, Munkhbayar and ORM have established local boards in all eight counties within the three provinces in the Onggi River Basin; recruited nearly 4,000 supporting members; and carried out information campaigns, press conferences, town hall meetings and a 470-kilometer march along the Onggi river. After the fall of the USSR, when former Soviet allies ushered in a new era of free market development, Munkhbayar became increasingly concerned about the shrinking river, both for the people who rely on the resource and for the protection of lands his family has lived on for centuries. As gold mining greatly expanded, more than 30 companies were allowed to mine along Onggi River tributaries. Indiscriminate, illicit mining and weak law enforcement resulted in the rapid destruction of the environment and natural resources across Mongolia. Devoting all his time to working with ORM, Munkhbayar eventually convinced the government to increase and enforce mining regulations in the region and to stop damaging mining activities and begin environmental restoration. In May 2006, the Mongolian Parliament passed the Law on Minerals, which regulates mining and protect precious waterways. In addition, 35 of the 37 mining operations working in the Onggi River Basin have ceased destructive operations. Erel Mining Company (the most egregious violator) has been shut down and the Onggi River is flowing higher and farther than it has at any other time in the last two years. Tsetegee Munkhbayar, accepting his award at the 2007 Goldman Prize ceremony. Tsetegee Munkhbayar, receiving his award at the 2007 Goldman Prize ceremony. Tsetegee Munkhbayar,2007 Goldman Environmental Prize Recipient for Asia (Mongolia).